This book is about coming out, I mean really coming out, in a world against anything different, or “queer”. Queer is such an inclusive term now, it encompasses so many forms of oppression (eg sexuality, race, class, gender identity, etc) and really shows how they all intertwine in a system of institutional biases. But for the main character of this book, Molly, it’s a derogatory term for people who are attracted to the same gender as themselves. What I really love about this book is that its a real coming out novel. Molly faces homophobia from everyone around her– her parents, counselors, and friends. I really felt for Molly and experienced the pain of rejection along with her. Molly was so determined to never let other people get to her, and that made me proud to be feeling these emotions with her. Although this novel is set in the middle 1900’s, LGBT youth and adults still face these problems today. This really opened up my eyes to how much things haven’t changed in the past 50 years. Yes, lesbians are not constantly called “dykes” and “queers” in a derogatory way, but homophobia and transphobia still exist in the everyday world. LGBT youth are 7 times more likely to attempt suicide that straight youth because of this very reason. Although I can absolutely admit that we have come far in the gay movement, there is still a lot of work to be done. 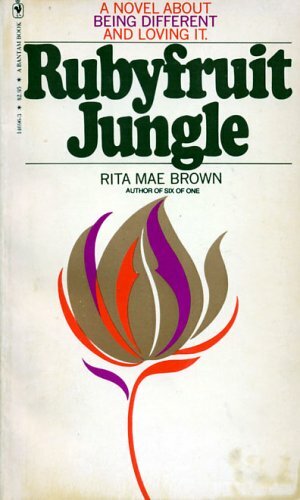 I praise Rita Mae Brown for writing such a powerful novel about the struggles of coming out in this world and hope to read more books like this one.